Hasta siempre compañero Eduardo Galeano! Eduardo, your life, your thought, your creativity, your social engagement and your love for humanity throughout, will always be with us! Eduardo Galeano (1940-2015) has just died, but he will stay among us and the future generations. His work is not only literary: it is part of the history of Uruguay, of Latin America and the world. For he is “the voice of the voiceless”. 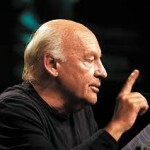 The role of Eduardo Galeano was transcendent when he analysed and concluded, along with Quijano (1) in the “Marcha” Review (2) that before any “third road” is sought in the world, it is necessary to pose that Socialism was, and will remain, the only historic alternative to imperialism, to capitalism. Likewise, he played a fundamental role in the weekly “Epoca”(3) in 1968 by opening this review to all the left tendencies – each entitled to one page. This is how the weekly publication of the page “Frente Obrero en Epoca” (4) carried the texts of our master J. Posadas. ‘Epoca’ laid the historic foundations for the subsequent and organic creation of the Frente Amplio (5) in 1971. As a journal, ‘Epoca’ was a centre for the public discussion of the ideas of the entire Left, at a time when it was particularly divided and dispersed under the blows of capitalism and imperialism. ‘Epoca’ responded to a necessity of history that found its expression in the creation of the Frente Amplio (Enlarged Front), the CNT and – after the fall of the dictatorship – “Brecha”(7) and the PIT-CNT(8). Eduardo Galeano was a passionate, polemical and engaged man, brimming with warmth and human love. He defended “mother earth” and humanity against the aggression of the multinationals, the oligarchy and all the corrupt politicians. With his articles and books, he was conducting a battle for truth and justice, in defence of life, water and human rights. We keep in our minds his presence along with that of the dear comrade artist Daniel Viglietti(9), when a popular occupation of the Supreme Court of Justice sprang up spontaneously to defend the brave woman-judge Mariana Mota(10) in defence of the Marches for Water and Life (11) and against OGMs and open-cast mining. We remember clearly Eduardo Galeano’s participation in the great People’s Congress March (12) where he told visiting Bush that he was “persona non grata”. We recall well the anti-war marches he attended over Vietnam, Iraq, Afghanistan, and all the imperialist wars in the world. His life and literary work form a whole. From his “Open Veins of Latina America” and “Book of Embrace”, to his “Memory of Fire” and “Football in Sun and Shadow”, his joyous passion is rich in lessons on life. As when he says: “We won here, we lost there, but we had a good time of it”. Eduardo Galeano is for ever present in the heart of all the Latino-Americans thanks to his human warmth, his commitment to Latin-American unification, his anti-imperialism, his friendship for the great comrade Hugo Chavez, for Fidel Castro, Evo Morales, Nicolas Maduro, to name but a few of his friends. 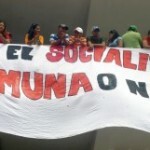 Of all these people, it must be said that they will live as long as there are peoples, as long as the “fueguitos” keep burning, the small fires of love and social struggle. 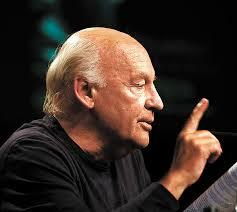 Dear comrade and friend Eduardo Galeano – your work will live on inside your people – a people of no frontiers. (1) Carlos Quijano (Montevideo 1900-México 1984): Uruguayen barrister. Founded the weekly “Marcha” in 1939 where he remained director until ordered to close in 1974 by the military dictatorship. Quijano hailed from a nationalist current originally called “tercerist” – seeking equidistance between imperialism and the URSS. After the Second World War, he became influenced by the colonial revolution in Africa and Asia, as well as by the Chinese Revolution, the extension de USSR in Europe and the creation of new Workers States and Revolutionary States. After the triumph of the Cuban Revolution, he moved further towards the comprehension of Socialism and its defence. (2) “Marcha”: Weekly publication in Uruguay (1939-1974) led by Carlos Quijano, with Eduardo Galeano as Editor in chief. It represented the best of political, social and cultural life in the second half of the twentieth century in that country. It expressed the progress of the nationalist currents, of the intellectuals and of most of the population. Its pages were open to all the tendencies. (3) “Epoca”: journal founded in 1964 by Galeano and closed in 1966. It was supported by the tendencies of the left – Communist Party excepted. (4) “Frente Obrero en Epoca”: That was a page published each week in ‘Epoca’ between July 1966 and February 1967 by the Partido Obrero Revolucionario (Trotskista) [POR(t), Uruguayan section of the IV International led by J. Posadas. (5) Frente Amplio, or Enlarged Front, is a coalition founded in 1971. It is made of workers’ parties, nationalist currents and sectors that became detached from the two bourgeois parties (Partido Nacional and Partido Colorado). 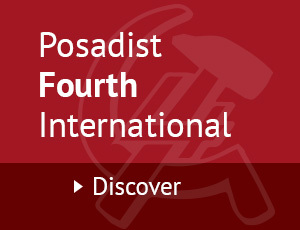 The POR(T) – Revolutionary Workers Party (Trotskyist) was a co-founder of the Frente Amplio. On inception, that Front was expressing the revolutionary ripening taking place in the country’s proletariat and masses. Its anti-imperialist and anti-oligarchy programme was notable for its demand to nationalise the banks and the (frozen) meat packing industry (for export). It also aimed at agrarian reform and the revision of the external debt. The Frente Amplio won for the first time in the elections of 2004, and won again between 2009 and 2014. (6) CNT: Workers’ National Convention in Uruguay. This single TUC was set up in 1966 by trade unions of various allegiances. (7) “Brecha”: Weekly publication that started in 1985, after the fall of the civilian-military dictatorship. Its intention was to follow in the footsteps of “Marcha”. It consistently published the articles of Eduardo Galeano. (8) PIT-CNT: the PIT is also called the Workers’ Inter-sindical Plenary, a name adopted by the trade unions after the CNT was outlawed by the dictatorship between 1973 and 1985. When ‘democracy’ returned, the name PIT-CNT was adopted to evoke the reanimation and the reorganisation of the proletariat. (9) Daniel Viglietti: Born in 1939, he is one of the most important singer-composer in contemporary Uruguay. His songs always reflected and supported the revolutionary struggles of the masses of Latin America and the world. (10) The Penal woman-judge Mariana Mota: She took on the investigation of 80 cases of detention-disappearance under the dictatorship. Under Mujica’s presidency, the Defence minister denied her access to the Military Archives. She was then taken away from this investigation and migrated to civilian Justice by the Supreme Court of Justice. This triggered the popular occupation of that Court in her support. (11) Marches for Water and Life: These come from rural popular movements opposed to open-cast mining, fracking, trans-genetic modification, agricultural pesticides and in the defence of water. (12) The Peoples’ Congress: Emanated from a meeting in August 1965 of more than 700 trade union, popular and social organisations, cooperatives, students, professionals, peasants and religious orders. This meeting responded to the aggravation of a capitalist crisis already deemed intractable in 1955.